The following is a rough synopsis of some of the shows I like, and why. There may be spoilers for some of the shows, so you might want to be selective about which ones you read! The A-Team: A team of crack commandos illegally help people in the 80s. Babylon 5: A space station in the future proves to be the Universe's last hope for peace and victory. Battlestar Galactica: The last Battlestar searches for Earth. Buffy the Vampire Slayer: Buffy battles demons and other evil. Jeremiah: 15 years after the Big Death killed everyone over the age of innocence... Kurdy and Jeremiah try and do good. 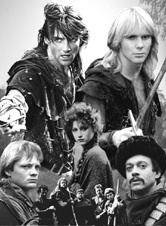 Robin of Sherwood: About two men and their band of merry men. Star Fleet: The Imperial Alliance want the F-zero-1. Who can save them now? Stargate SG-1: A team of explorers travel the galaxy in search of technologies and allies to help fight the Go'auld. BBC Wimbledon Tennis Coverage: People with racquets battle one another to become the Wimbledon Champion. The A-Team were an elite crack commando unit that escaped from a maximum security prison because they were innocent of the crimes they were charged with. They drove around in their black van, helping people out. Technically they were mercenaries but they didn't really charge nice people who genuinely needed their help. The team was led by Colonel Hannibal Smith, master of disguise played by George Peppard. Then there was BA Barracas, played by Mr T. BA drove the van and was a mechanic, too, helping underpriveliged children in his spare time. The good-looking one of the team was Templeton Peck, better known as Face, who never acted like he had ever been a soldier (played by Dirk Benedict). The fourth member of the team was Murdoch, played by Dwight Schultz. He was the best pilot around, but certified insane, although it always seemed that Murdoch used the insanity as an excuse and a shield to hide his real self behind. The people loved the A-Team, especially their reporter friend, Amy, but they did have enemies, most notable of which was Colonel Decker - a very driven and perhaps slightly crazy man. One of my favourite Decker moments is when Hannibal, dressed as a giant crocodile, lures Decker and his car into a channel through some water, and then releases the flood gates. I wonder if the analogy to Moses crossing the Red Sea was deliberate? Babylon 5 is almost certainly the best science fiction TV show ever, and highly underrated by a lot of people. The main story revolves around the command staff of the station, and the diplomatic envoys sent there. The station itself is designed as a place where humans and aliens can meet and trade in peace, but the course is rarely smooth and the various alien races go to war or object to the Earth-based administration taking too much control of situations. The beauty of the show is that, for the first four seasons at least, it never gets boring. There are character episodes, plot episodes, political, moral and observational episodes and all the time, in the background, something bigger is building. As the series progressed, it got more exciting, and with episodes like 'Babylon Squared' you can see that J. Michael Straczynski was carefully crafting something very clever. It was a real shame about season 5, which was doomed from the beginning. Forced to hurry the main plot - the war against the Shadows, which finished in season 4, and the war with Earth, both of which were excellent, the material left for season 5 was thin on the ground. With Ivanova (Claudia Christian) and Marcus gone they loft two of the best characters. The main plot about the telepaths was not worth stringing out for so long, and in my opinion, the treatment of Lennier was atrocious. The last episode really didn't fit because it was filmed at the end of season 4, and overall the season is one I prefer not to watch. That's not to say that there was nothing good about season 5, but the overall effect was disappointing. Actually, Zack Allen is the one thing for which I will watch, and the Londo and G'Kar storylines. These are excellent, and perfect products of the previous seasons. My personal favourite character is Lennier - he is strangely amusing, and the change from the quiet young Minbari he was initially to being hard and slightly deranged is well done, although I think his final actions were very out of character. Marcus was also great, a wonderful addition for season 3, and by far one of the funniest episodes is the one where he and Stephen (the doctor) are sent to Mars, posing as a married couple. this was a show with a sense of humour, and that really set it apart from other science fiction, particularly at the time at which it was being made. Another show with the lovely Dirk Benedict in, the story revolved around the plight of the Galactica, the last Battlestar of a bunch of planets named after starsigns. The Cylons wiped everyone out, and somehow only the Galactica escaped, under the command of Commander Adama. With everyone on their 12 planets dead, they decided to head for the fabled 13th planet; Earth. On the way they encountered all sorts of problems: Cylons, traitors and, the worst enemy of all: Muffit the Daggit. The main characters were Apollo and Starbuck, and their friend Boomer, who were all Viper, which were the Galactica's X-wing rip-off fighters. Most episodes they would somehow find an excuse to take this little boy, whom Apollo's girlfriend had adopted, and let hi mechanical toy, Muffit, find the enemies. Then they would run away, shooting all the time. One of te best episodes was when they found a Cylon base station near a planet and decided to launch an attack and pretend they had more fighters than they did by talking into the radios several times. The Cylons were convinced and fled, crashing into the planet. Teach them to monitor radio communications! The series, as with most series, got bad bad towards the end. I personally think it deteriorated when they brought the little crazy blond-haired boy onto the ship and let him run things. In doing this, they killed off Starbuck, and they really needed him to keep the character dynamic going. Then they got to Earth and THAT was a mistake and a half. Aside from the flying motorbikes, everything that happened was just bad. Troy and Dillon were bad, the jumping children were bad... if they reach Earth, I say stop watching! Incidentally, I have no idea what they were thinking when they made the new series of this show. I'm not going to deny that it's a great concept - lots of intrigue and really gritty, but it's not Galactica by a long shot! Where's the daggit? The bad guys are scary, not cheesy, and the changes to Boomer... it's a completely different character, why pretend otherwise? It has great moments, too. The fabled musical episode (Once More With Feeling), the one where Angel dies, any episode with Oz in... all good stuff. However, it does fall down a bit in Seasons 4 and 6. Season 4 is great because of Riley, and the Initiative plot is pretty cool. But they leave Xander and Giles in bad places, and the show suffers for them suffering. They also didn't make the bad guy bad enough. Season 6 was bad because they spent too much time thinking about their emotions and dwelling on the negative feeling among the characters, and it certainly drained my positive emotion. Season 7 returned to form at the beginning, but then fell apart at the end, with too many weeks of wondering what to do and not actually doing anything, although the Faith storyline was very good, and the involvement of Andrew was a saving grace. The end was a bit disappointing, with very far-reaching implications that they didn't go into. As for Angel, I think it's better than Buffy by a long shot because it retains the humour but can deal with grittier subjects, and has a fantastic cast of characters. Wonderful show, lots of fun. This is J Michael Straczynski's new project: a post-apocalyptic tale following the plight of two characters called Jeremiah and Kurdy. The basic background to the story is that fifteen years previously there was a plague that wiped out everyone past puberty, imaginatively called the Big Death by the children survivors. These children have grown up and are living off the scraps of the old world, unable to rebuild. There are pockets of civilisation - towns and army bases, where people survive and hope for something better. Jeremiah and Kurdy work for a place called The End of The World, a nuclear bunker in Cheyenne Mountain (aka Thunder Mountain) where there is plenty of food and supplies. The people inside, led by the charismatic Marcus, are afraid to let anyone know where they are, wisely predicting that they would be descended upon and everything would be taken. So instead they send operatives out to find people and help them, perhaps take them to Thunder Mountain, or spread news and to gather information. And it seems that the Big Death may be coming back. Jeremiah also writes to his Dad a lot. This is probably the most exciting adaption of the Robin Hood tale I've ever seen, although it is still a little flexible with the truth and reality! In the first two seasons, Robin Hood is played by Michael Praed, and the story follows him and his merry men as they thwart the Sheriff of Nottingham repeatedly. However, they have another enemy: Simon WHO, a sorcerer of no mean power. Contrary to the traditional tales, they are aided by Herne the Hunter (Robin is chosen as his son) and this allows for a slightly more mystical layer to be added to the story. In the third season, though, they change Robins to Jason Connery, and this allows them to further develop the remaining characters, and explore the other parts of the Robin Hood story, such as his connections to Huntingdon. The Sheriff is still their enemy, but they do have others as well. In my opinion, the last season wasn't as good as those previous to it, and the ending was wholely unsatisfactory, with threads just left dangling in the wind! This series had the best characters in it. Ray Winston's portrayal of Will Scarlet leaves all others standing, looking a bit petulant in the face of his temper. Everything he said sounded like swearing! But of course my favourite character was the much-maligned Guy of Gisbourne, who tried so hard but ultimately was afflicted with the incompetence gene, found in most evil second-in-commands and righthand men. His best episode was the last one, when he rebelled and ran off, although he was very funny in the one where he fell in love with the Jewish girl... shame the series had to end, really. I would have liked it to go on much much longer. "Send a message out across the sky, alien raiders just past Gemini. Who will come and save us now? Who'll defend us from the power? Star Fleet, Star Fleet!" What a great puppet show this was! The puppets were all so different, and the story was usually baffling, but it was cool. The Imperial Alliance wanted Earth to surrender something called the F-zero-1, or they would destroy the planet. But Earth had no idea what the F-zero-1 was, or what it might be. Unable to give the Commander her wish, they sent their only decent ship against them - the X-Bomber. It had lots of special weapons, including X-Impulse. They flew around a lot, got into trouble a lot and had the biggest chin on TV (belonging to the one and only Barry Hercules), while the rather pretty Lamia, adopted daughter of Uncle Ben (I mean Dr Benn) pondered her mysterious origins and whether or not she was the F-zero-1. Shiro was really the main character: a cool pilot who had something of a 'thing' with Lamia. this was 1983 kids TV at its finest! It was only a matter of time before this TV show wormed its way into my favourites list. I loved the film, always wanted to be Daniel Jackson, and then the TV series was of such high quality - it was inevitable. It's so easily picked up without needing to see previous episodes, which is a flaw the majority of other TV shows exhibit sooner or later. The characters are likable and consistent and nothing fundamentally changes, although a great deal can change through an episode. 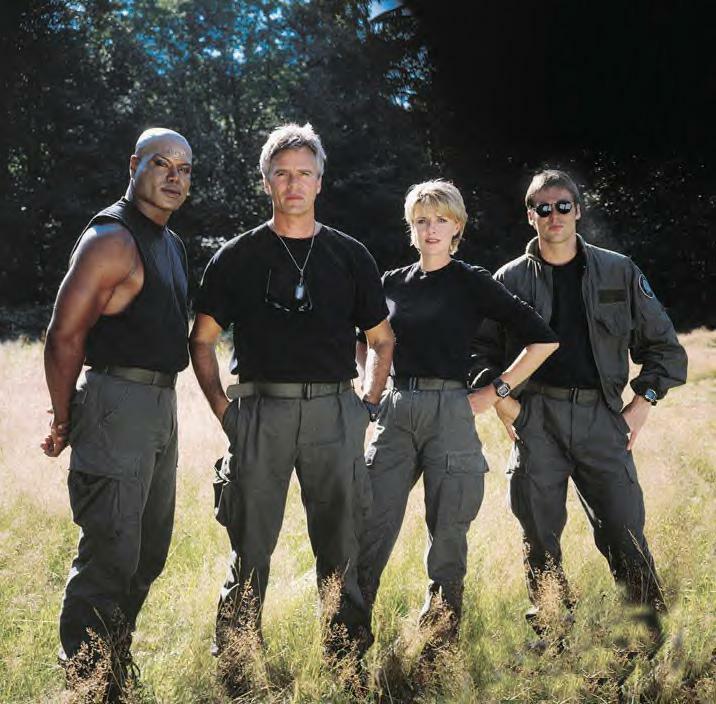 The team: Jack O'Neill, Samantha Carter, Daniel Jackson and Teal'c initially get together for a variety of reasons, but after a while they gain a unity of purpose. And their group dynamic is so realistic and well portrayed that you want to believe it's real. There's not much wrong with Stargate, except perhaps their decision to replace Daniel Jackson in season 6. Personally, I liked Jonas Quinn, but as a character in his own right, not as Daniel's replacement. In Season 8, as well, it seems to lose focus when they take Jack out of the team to run the SGC - his absence means a lot of the banter is lost, and therefore some of the appeal. The versatility of the writers is enormous, and it's hard to choose a favourite episode, although any of the ones when Teal'c makes a joke are very funny indeed. Actually, the one when Teal'c and O'Neill are stuck in a timeloop is excellent, and the 'Wormhole Extreme' episode is great, especially for the post-credits bits. I look forward to the day when all TV is this well produced and acted. Actually, citing this as one of my favourite shows is just an excuse to post up a picture of my favourite tennis player. I've been following his career since his first Wimbledon, and watched him fail so many times... when he won it I had to stop watching the second half because I thought I would jinx him to lose! My favourite tennis player is Goran Ivanisevic, although I do simply like the sport, crap at it though I am.